The recycling of these former prison grounds was the subject of years of wrangling, protest and design work. As built the project comprises a theatre, a casino (038), shops and housing. 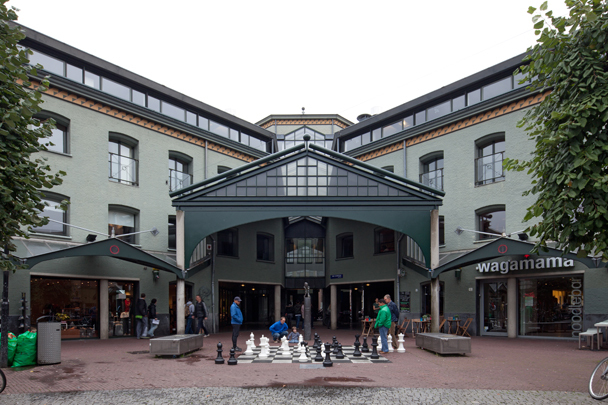 The cruciform house of detention was the springboard for this retail/leisure area set on the old fortifications. A new bridge pulls the area into the pedestrian route to Leidseplein. The curving course of the old fortifications along the canal (Singel) is marked by a multi-layered screen. Beyond this is the round gaming hall with its lively illuminated ceiling. The old Lido villa has been restored and drawn into the complex.